This swung vase features a design of raised circles surrounded with beads. The base measures 3 3/8 inches and has a 20-point star. 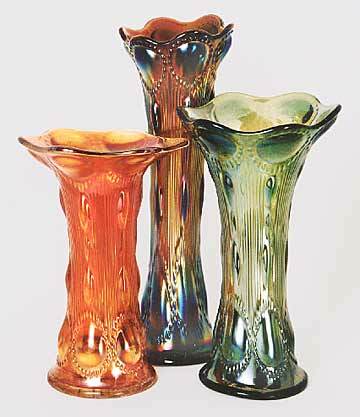 Heights range from about 6 inches to 12 inches and the top can be quite widely flared, especially on some of the shorter examples. Similar patterns are Bullseye & Beads and Bulleye & Loop.